You GUYS… I have a serious addiction to cake mix hack recipes and apparently red velvet. 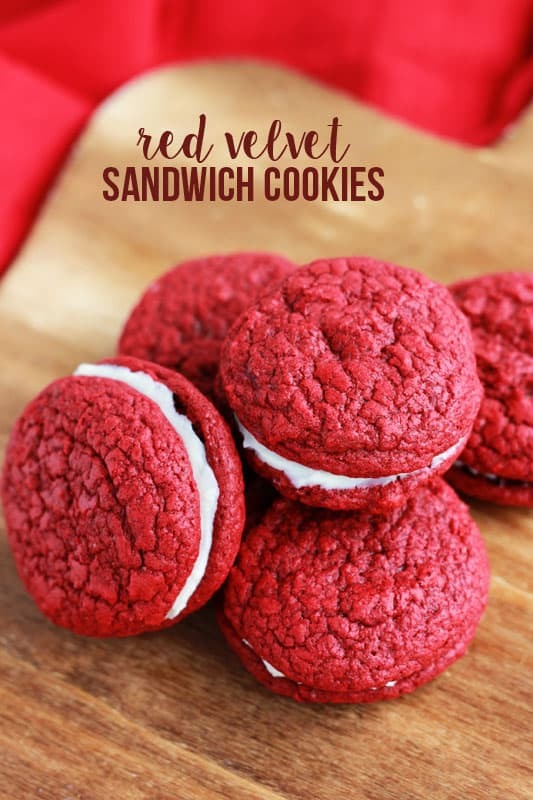 These Red Velvet Sandwich Cookies are A-MAZ-ING with a capital “A” and should be added to your valentines dessert mix asap. Time is ticking! 1. It is insanely easy. When I say “insanely” I mean dump all of the ingredients into a bowl, give it a stir, and pop those little red bites of deliciousness right into the oven. 2. It’s bold red color. Nothing says valentines day like a beautiful red velvet. 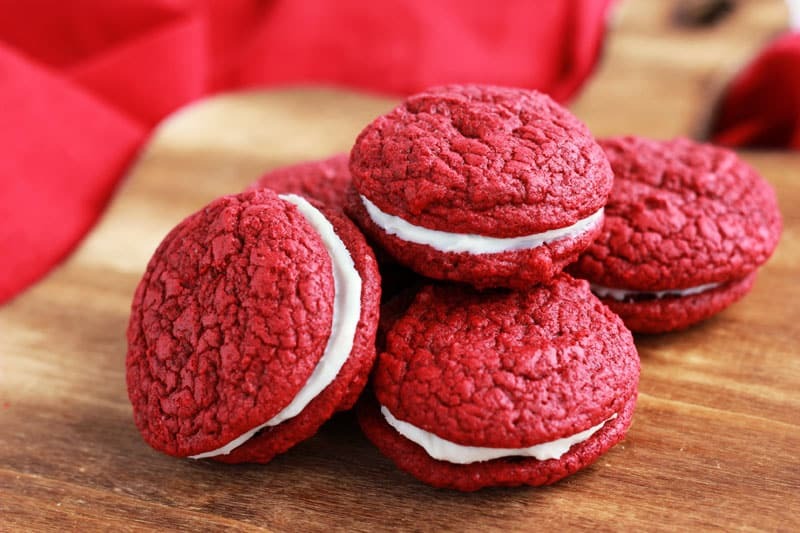 Speaking of which… Have you seen my red velvet cake, cupcakes, and whoopie pies?? NOW… Let’s dive in to the nitty gritty. Before we get started you are going to want to run to the store and pick up a few things… a red velvet cake mix, eggs, oil, and vanilla. Dump all of those ingredients into a large bowl, give it a good stir, and scoop out each cookie onto your prepared sheet. Bake to puffy perfection, press two cookies together sandwiching a big ol’ scoop of cream cheese frosting between the two, and watch them disappear before your eyes. This recipe is actually a great one to make with all of your little helpers. I brought my six year old into the kitchen for this one and he did 99.9% of the work. I was mostly there to supervise and place the cookie sheet into the oven. His tiny arms aren’t ready for that big step. I put the frosting into a ziplock bag and snipped the edge to make filling each cookie pair just a little bit more fun. He loved creating fun little designs and squishing things together and couldn’t wait to take plates of these goodies to all of our friends and neighbors. For the cookies:Preheat your oven to 375 degrees. Line two cookie sheets with parchment and set aside. 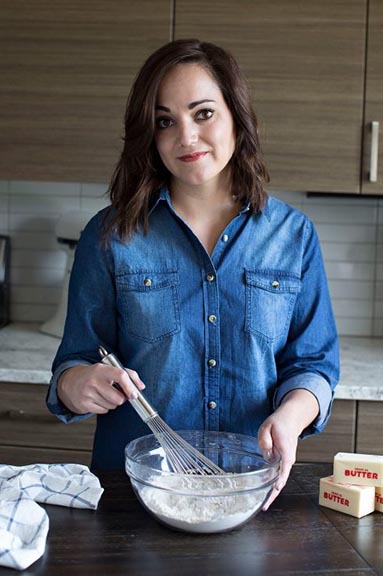 For the frosting: Combine the cream cheese and frosting in the bowl of an electric mixer. Whip until fully combined and smooth. Add the vanilla. Stir in the powdered sugar 1/2 a cup at a time until your desired consistency is achieved. So in case I don’t see you before the big day, happy Valentines day all of you lovelies. How are you celebrating this year? Can’t wait to make these for the party we are going to. A ready made bite of everyone’s favorite cake!